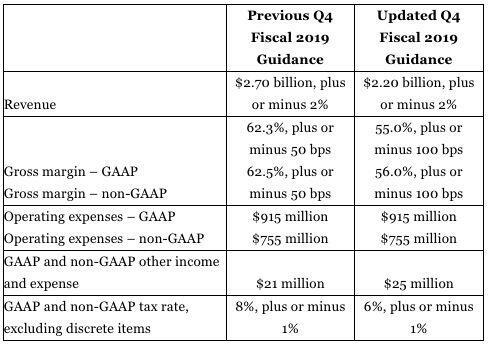 NVIDIA (NVDA) just cut its guidance for Q4 fiscal 2019. Management now expects the company to report revenue of $2.20 billion, down from previous guidance of $2.70 billion. Shares fell 14% in pre-market trading. The chip giant had previously accounted for weakness in its gaming division. However, management on Monday pointed to “deteriorating macroeconomic conditions, particularly in China” as further harming demand for gaming chips. Additionally, management said the company’s datacenter business also fell short of expectations. “A number of deals in the company’s forecast did not close in the last month of the quarter as customers shifted to a more cautious approach,” the company said in a statement. “Q4 was an extraordinary, unusually turbulent, and disappointing quarter,” CEO Jensen Huang said. “Looking forward, we are confident in our strategies and growth drivers. In a table breaking down its updated guidance, management revised lower its expectation for gross margins, which means earnings will be substantially lower than previously expected. Revenue and margins have been revised sharply lower. This means earnings will be particularly ugly. “Global trade has slowed in recent months and leading indicators point to ongoing deceleration in global trade near-term,” FedEx CFO Alan B. Graf, Jr. said in December.